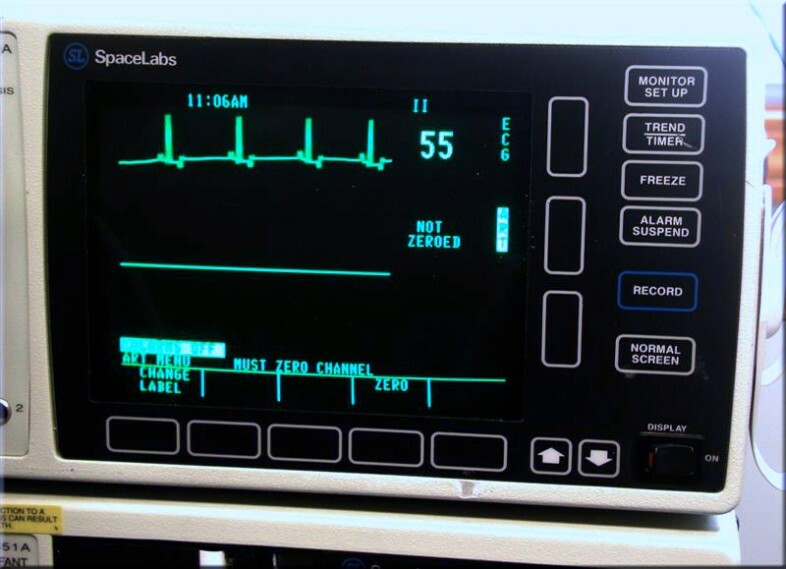 Basic needs for arterial blood pressure monitoring include freshly mixed heparinized saline, IV catheters (20 GA, 22 GA, 24 GA), luer lock 3-way stopcock or lure lock T-port, small diameter pressure tubing, and pressure transducer. 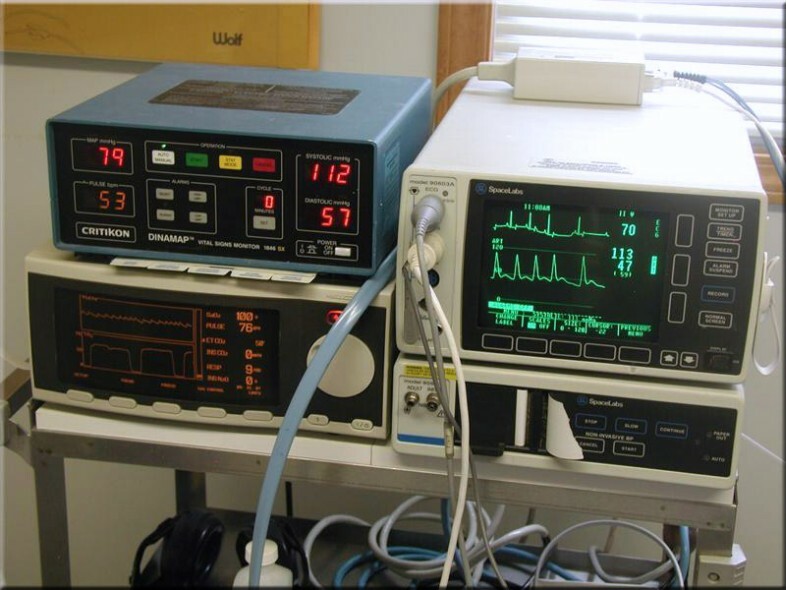 In addition, you will need a direct blood pressure monitor and the appropriate cable for the transducer used. This is the basic sequence; what connects to what. 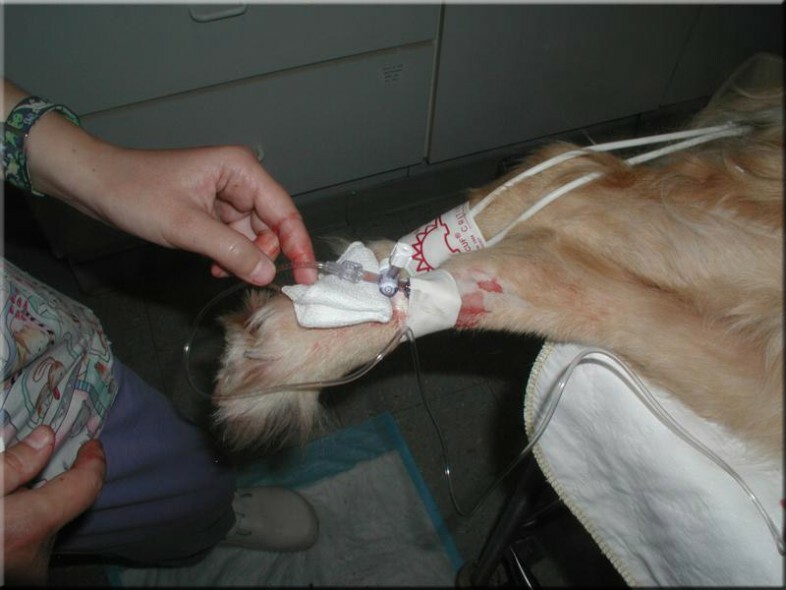 Remove the catheter end-cap and flush the catheter with hep saline. 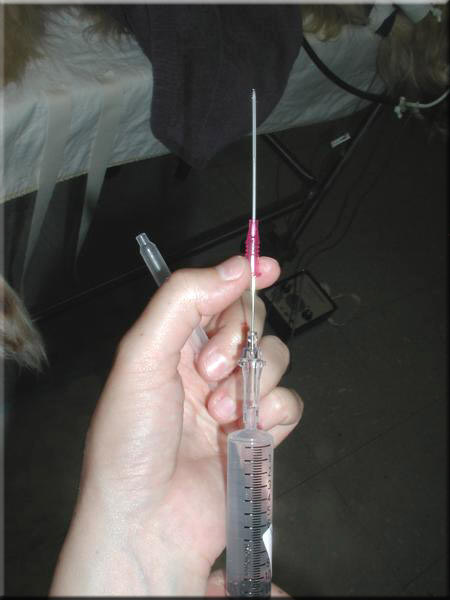 Slide the catheter up the stylet to flush the inner catheter wall and facilitate catheter advancement once introduced into the artery. Flush the 3-way stopcock filling both arms. Next fill the transducer with hep saline making sure no air bubbles are present. Initially flush through the perpendicular arm of the 3-way stopcock. 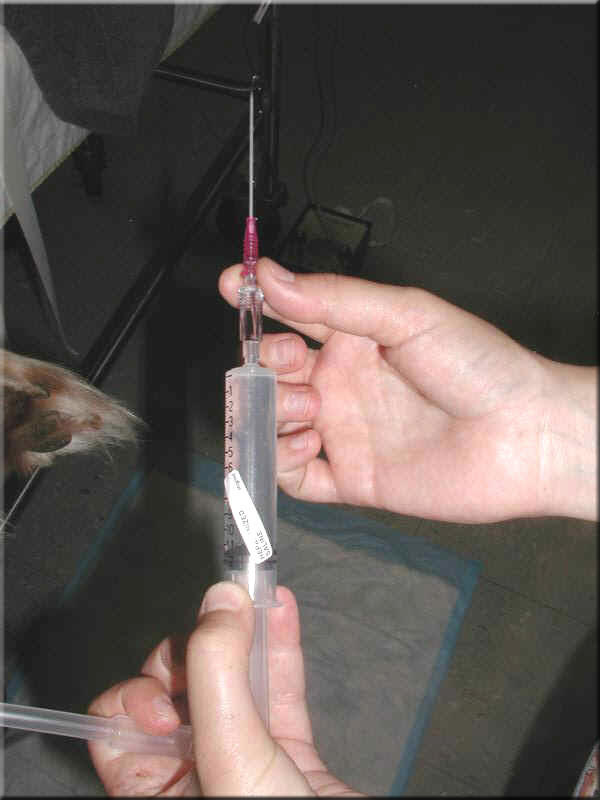 Then attach the pressure tubing to the stopcock and transfer the hep saline syringe to that perpendicular port. 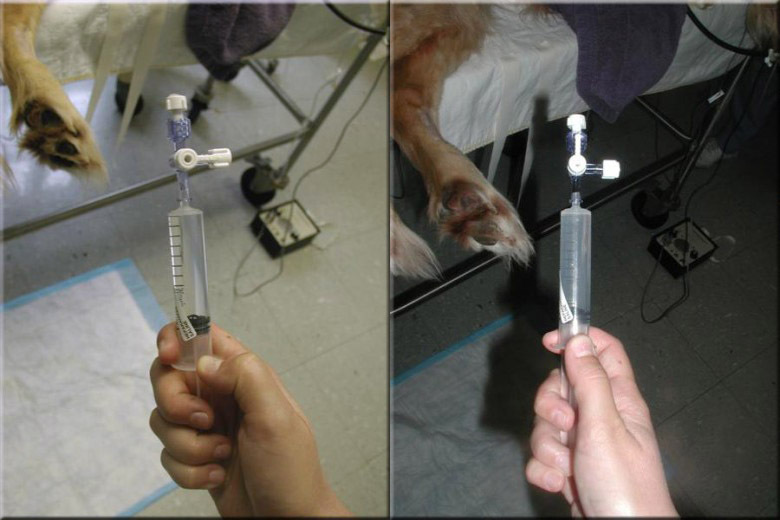 Rotate the valve to direct flow into the tubing and flush with hep saline. 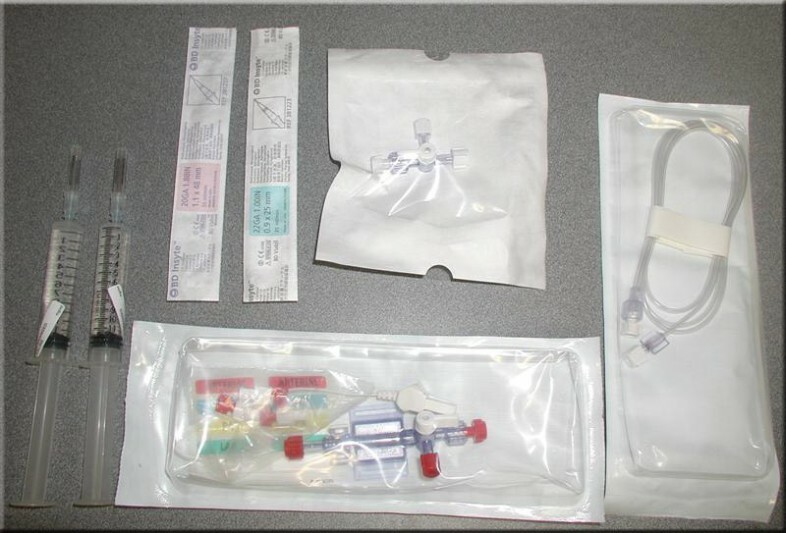 Now you are ready to place the arterial catheter. Keep all ports and fittings covered with sterile caps. 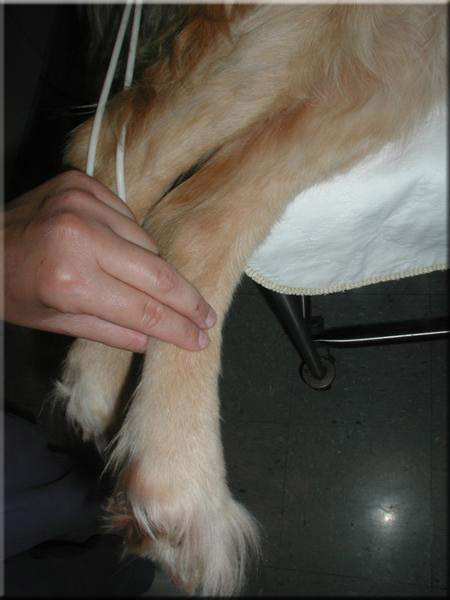 The most common site for canine direct arterial blood pressure monitoring is the dorsal pedal artery. This artery is usually palpable over the dorsum of the metatarsal area. A small area is clipped and prepped over the arterial site. 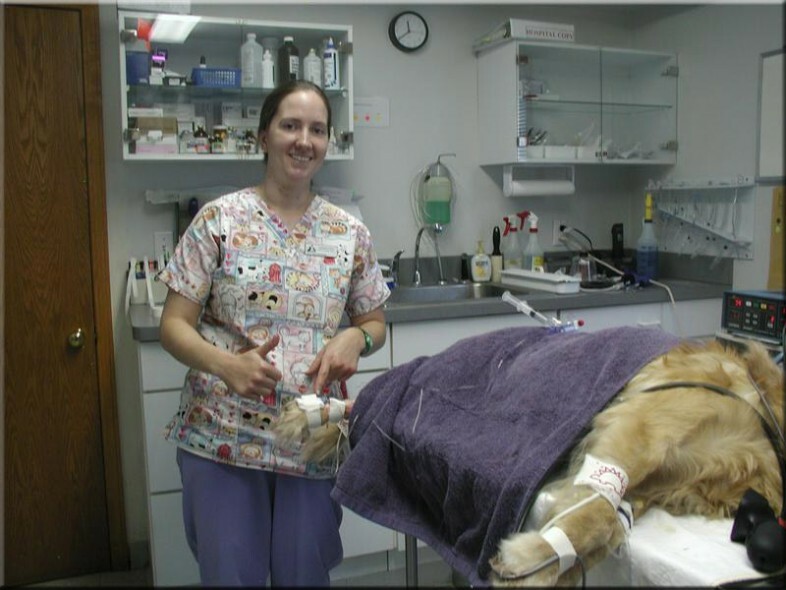 An absorbant pad is a good idea below the catheterization site. The 3-way stopcock and tubing are attached. And secured into place. The opposite end of the tubing is attached to the pressure transducer which should already be secured to the monitor cable. 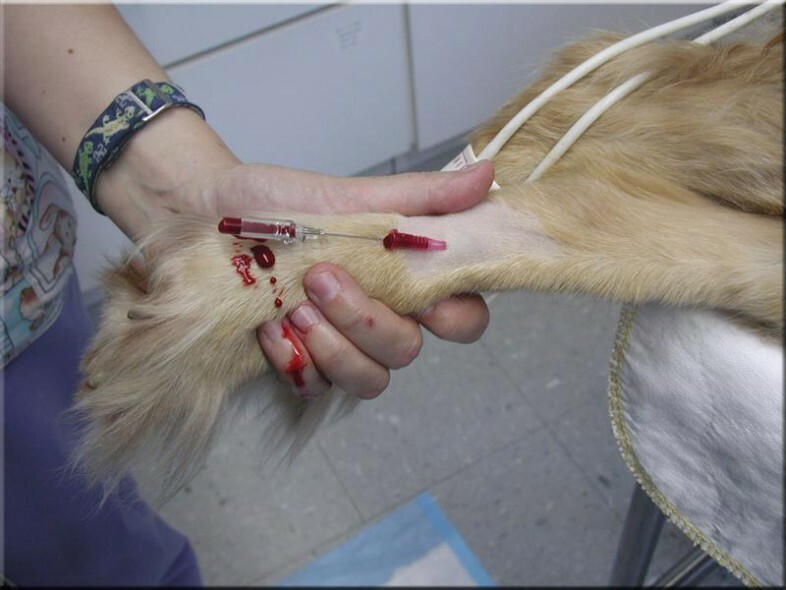 If the patient connections are not adequately secured large volume blood loss can occur in a short period of time. This is especially concerning as this site is usually tucked away under draping out of site. Typical monitor display. 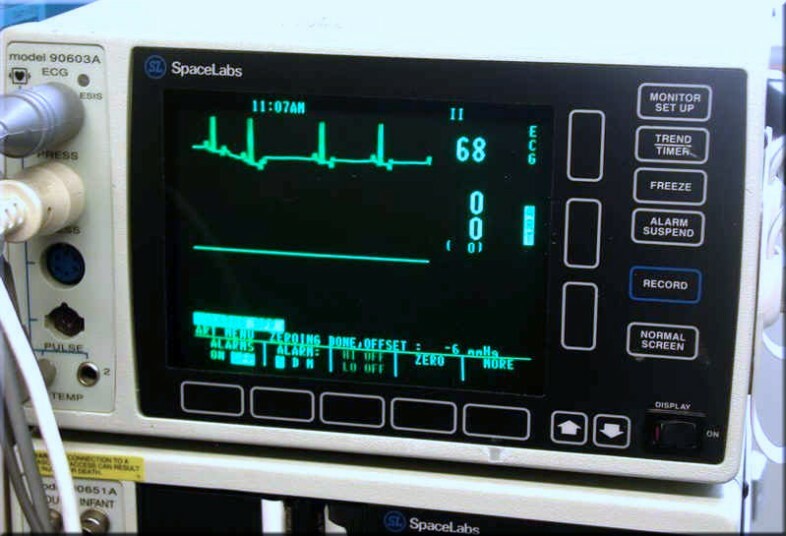 Select ART for arterial blood pressure monitoring. Rotate the valve to expose the tranducer chamber to normal atmospheric pressure. The transducer should be zeroed and maintained at heart base level. Then press the zero button. The display should read zero. 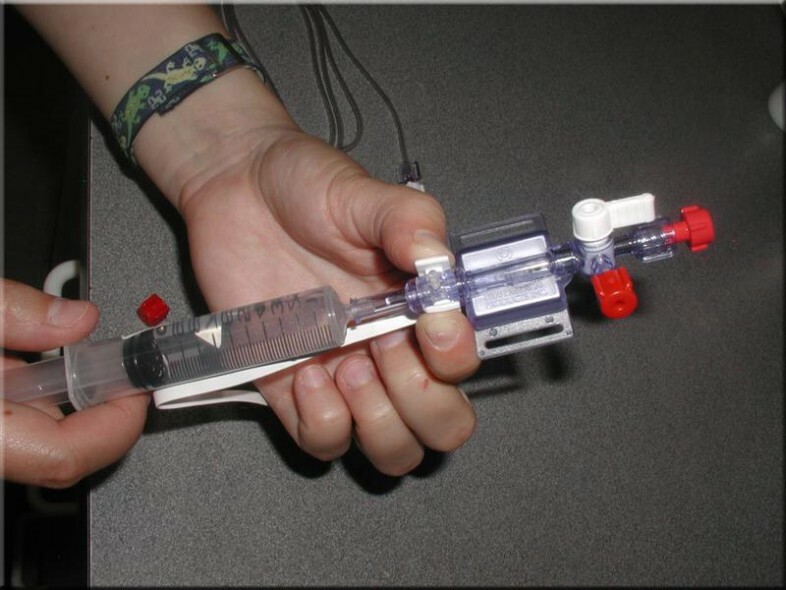 Attach a hep saline syringe to the open 3-way valve port at the transducer, rotate the valve to close flow to the transducer and flush the tubing and catheter. 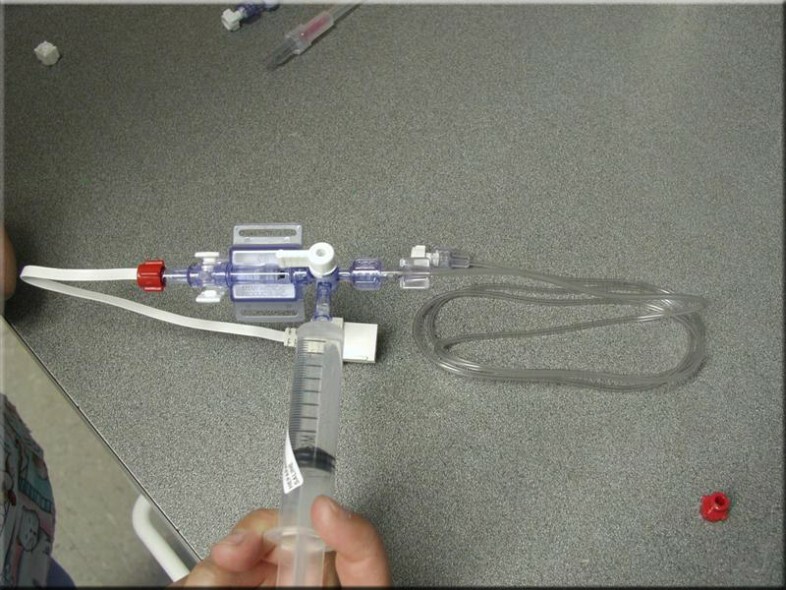 Then rotate the 3 way valve to allow continuity between transducer chamber and the arterial catheter. 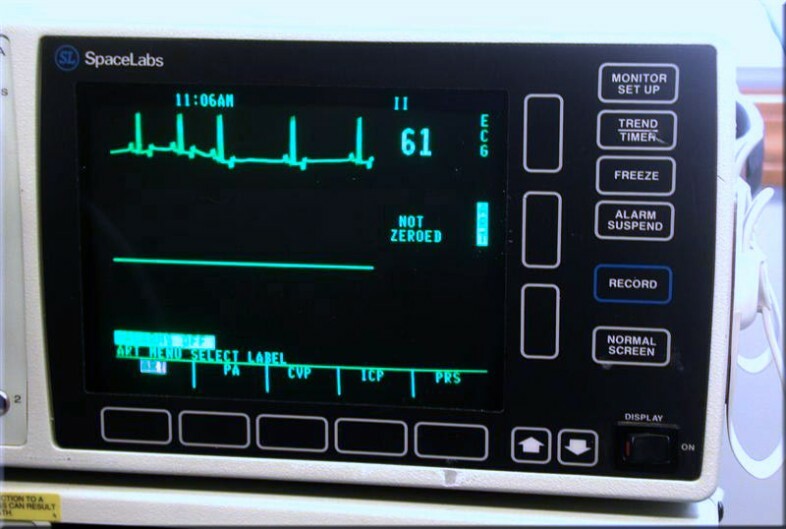 You should see a well defined waveform. If the wave form dampens over time, repeat the flush, being attentive to the total hep saline volume used during the procedure. A big thumbs up for a well placed art line. 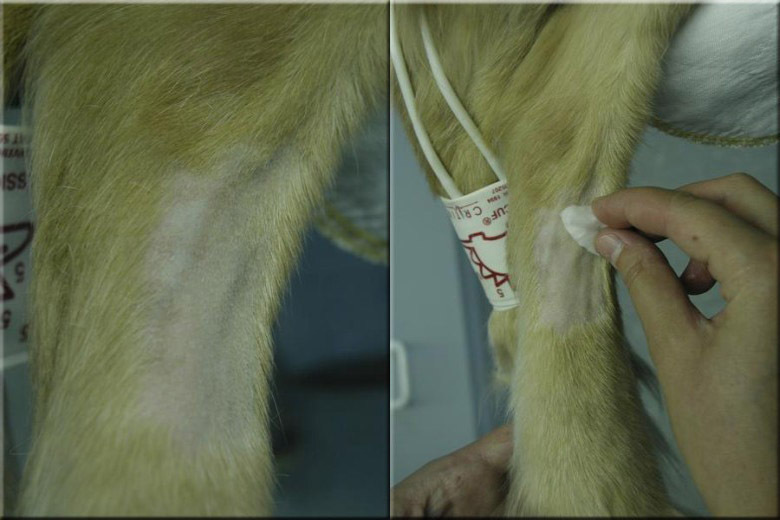 The transducer should be zeroed and maintained at heart base level (sternum level if in lateral, point of the shoulder if in dorsal or ventral recumbancy) for the most accurate results. 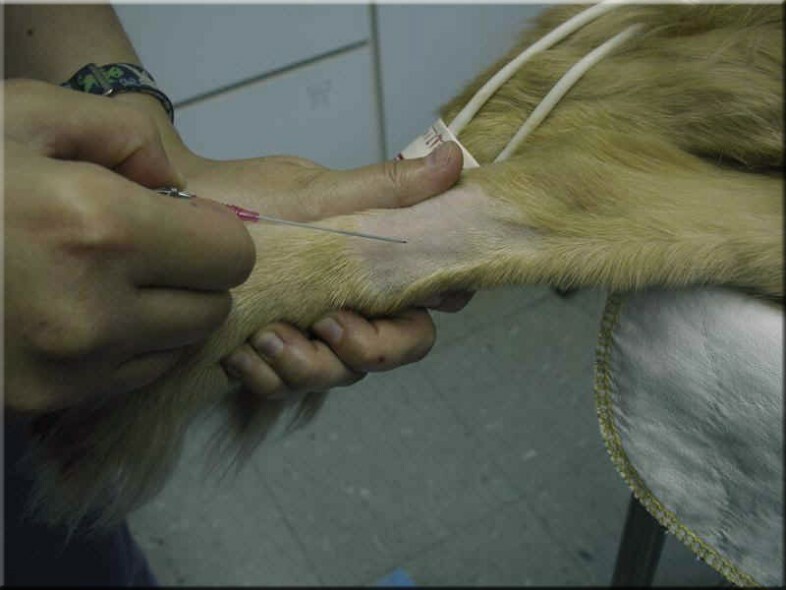 The fluid line needs to be flushed periodically (and whenever the pulse wave dampens) to avoid clot development at the catheter site. 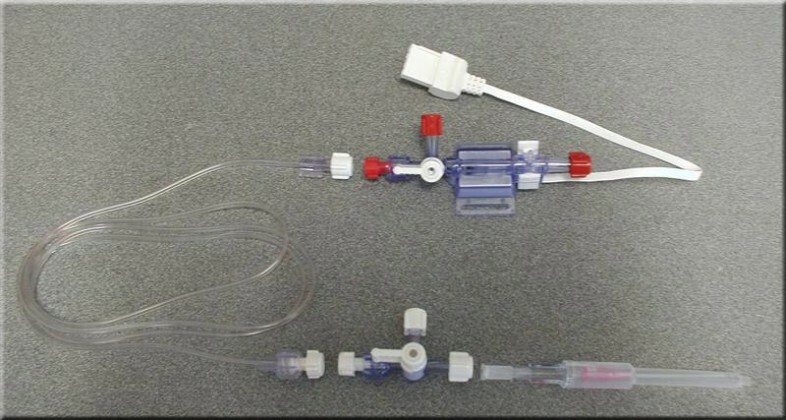 If the flush fluid flows easily but very low pressures register immediately check the arterial catheter site for poor connections/hemorrhage. 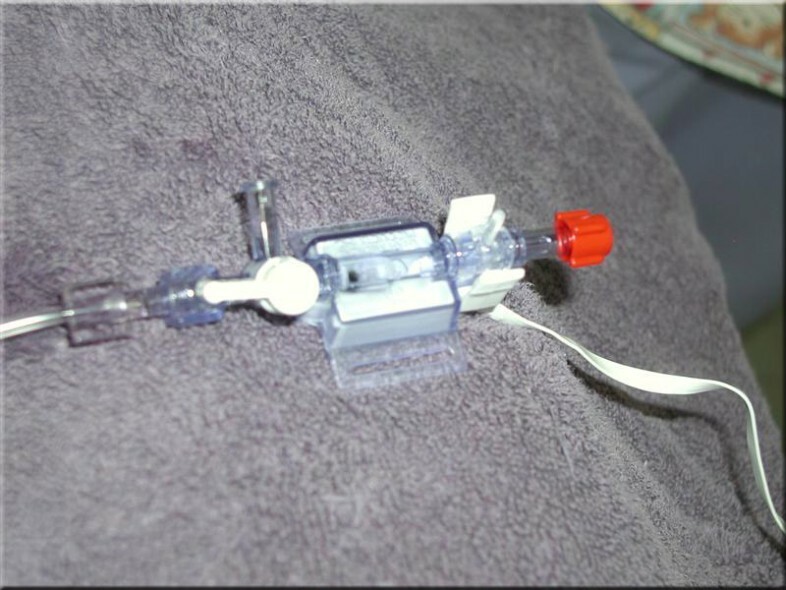 Be conscious of hep saline fluid volumes administered during flushing - especially in smaller or CV compromised patients. 1. Direct Blood Pressure Monitoring. Raffe MR. 2005 IVECCS Proceedings. 2. Direct Blood Pressure Monitoring. Waddell LS. Clin Tech Small Anim Pract. 2000 Aug;15(3):111-8. 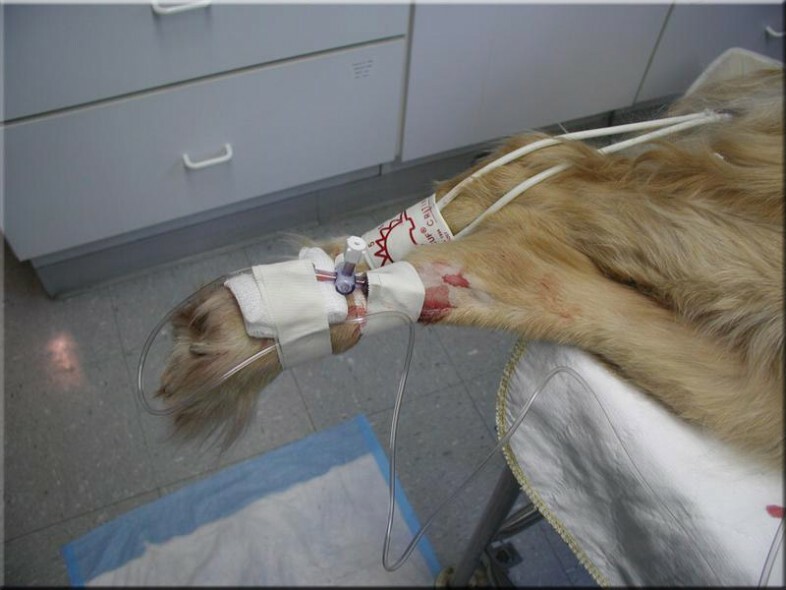 Questions or problems regarding this web site should be directed to DRSTEIN@VASG.ORG . Last modified: April 6, 2011 .